BibleX: Keener on the "Ends of the Earth"
After an extensive discussion of how the ancients understood the "ends of the earth" (pp. 704-8), Keener notes the following concerning Acts 1:8. "Therefore it seems likely that Luke's "ends of the earth," while prefigured at various stages (including his own conclusion), looks beyond the close of his work to the continuing mission. The "open end" of Acts invites Luke's audience to participate in this universal mission. Ultimately, context determines meaning; the ends of the earth meant different things in different contexts, but the LXX uses the phrase to emphasize universality. Thus there is a real sense, no outline after Samaria; the mission "reaches beyond the end of Acts." 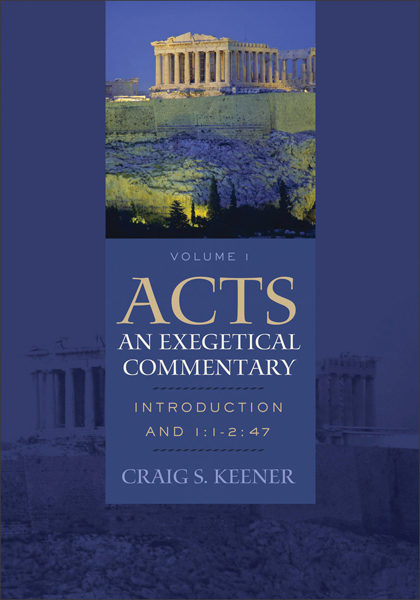 Craig S. Keener, Acts an Exegetical Commentary: Volume1: Introduction and 1:1–2:47 (Grand Rapids: Baker, 2012), 708.